Begin with a MB0867 bauble. Moisten a sponge and wipe bisque to remove dirt. On the DSS-0157 Under the Sea screen, locate the starfish. Draw an outline around it in permanent marker. Cut it out with the excess screen around the edges. Squeeze about two tablespoons of SC-8 Just Froggy onto the plate. Add a pinch of AC-310 Silkscreen Medium. Mix with a palette knife until it becomes the consistency of peanut butter. You may need to add more Silkscreen Medium or glaze. 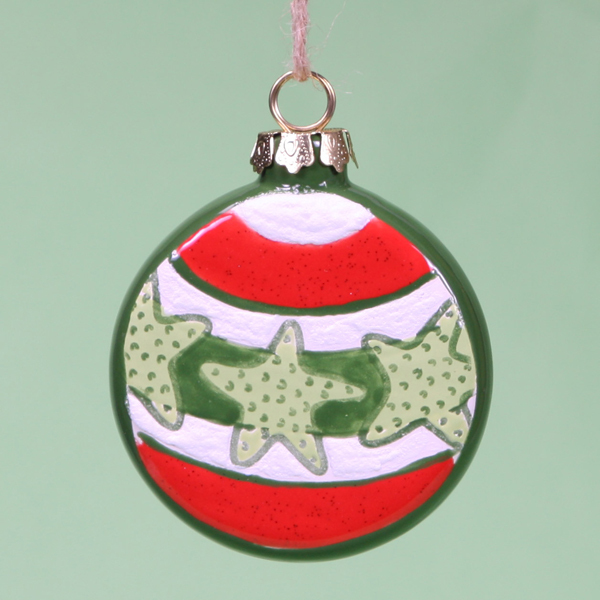 Place the starfish in the center of the ornament. While holding it firmly in place, take a small amount of premixed Silkscreen Medium, and gently rub in circles starting in the center and working outward. Slowly pull up the screen to avoid smearing. Repeat to the immediate left and right of the center starfish. Work quickly so the screen does not have time to dry. Using the pencil, draw the bands on the ornament. Refer to image. Using the Detail Liner with SC-78 Lime Light, apply two coats the starfish. Allow glaze to dry between coats. Using the Detail Liner with SC-8 Just Froggy, apply two coats to the band behind the starfish. Allow glaze to dry between coats. Using the Detail Liner with SG-302 Snowfall, apply one coat to the next upper and lower bands. Apply one coat to the band at the top of the ornament. Using the Scrip Liner with SC-73 Candy Apple Red, apply two coats to the next upper and lower bands. Allow glaze to dry between coats. Using the Detail Liner with SC-8 Just froggy, make a line between the SG-302 Snowfall and SC-73 Candy Apple Red. Using the Scrip Liner and Soft Fan, apply two coats to the sides and back of the ornament. Allow glaze to dry between coats. Using the Script Liner with SG-701 Star Dust, apply one coat to the areas glazed with SC-73 Candy Apple Red.